I look down. I’m 20, maybe 30 feet up, defending my fortress from invaders. Looking across the courtyard, then down at the precipitous drop below me, I know that if I step off the edge, I won’t really fall. But the digital world I’m inhabiting looks real enough to make me hesitant to move forward. I finally lift one foot off the edge of the platform I’m protecting, and in an instant, I’m airborne. To an observer, it may just look like I’m walking, albeit a bit awkwardly, but from my perspective, I’m falling through the air, as gunfire erupts around me. As I take in my surroundings—a futuristic space compound, ripped from the pages of a comic book—it’s easy to forget that back in reality, I’m just standing in the middle of a 6000-foot warehouse, as unassuming as any other on the northwest side of Chicago. I’m wearing a VR headset, participating in MassVR’s new ambitious gaming experiment. While based on some of the same technology as the ballyhooed consumer VR releases from Oculus and HTC a couple of years ago, MassVR is a different vision for what the future of VR can be. Think multiplayer VR meets laser tag arena. Founded in 2016 by Chris Lai, 42, MassVR unveiled its first VR arena earlier this year. A serial tech entrepreneur (online records list him as the registrar of 100 different internet domains since 2004) with a background in computer science, this is only Lai’s most recent venture. While in undergrad at the University of Illinois Urbana-Champaign in the mid-‘90s, he started his first, a game company—the employees of which have since gone on to work on major gaming titles such as Halo and Deus Ex. Lai is also the COO of SafeSpeed, an operator of red-light cameras. Try not to hold that against him. “Gaming has always been a passion of mine, and MassVR has an incredible opportunity to bring something new and exciting into the world,” Lai tells the Daily Dot. VR Champions—a first-person shooter simulation—is the first game the company has released for its proprietary platform. The objective should be familiar to most people: Use teamwork during four-on-four matches to earn points in a simple capture-the-flag-esque game. The platform tracks your movements in the real world allowing you to run, jump, and ride zip-lines through a virtual environment. MassVR’s vision is bigger than just this warehouse though. It claims its platform is scalable up to 10,000 square feet and up to 16 players, and it offers a “turnkey” package for operators who want to set up an arena in their own town. In fact, since our interview, the company is months away from launching two new locations, the largest of the pair being a 40,000 square foot facility with four separate arenas, observation decks for audiences to watch; and is unveiling a tournament with a $10,000 cash prize—making virtual reality worthy of being a true spectator sport. Up until this point, every major VR platform has made the same long-term promise: A VR headset that is completely wireless. One that would let you go anywhere, both physically and mentally. While we’ve seen progress on this front in recent months from Oculus and HTC, MassVR wants to take virtual reality from being what it has up until now—a glorified Nintendo Wii with a companion headset—to the next phase: an immersive, untethered experience that blurs what is real and what is virtual. Wires are dispensed with relative ease, using a basically off-the-shelf VR backpack from MSI. As for worrying about smacking into walls and people, MassVR has done some clever coding—mapping the virtual game to make it easier to navigate the physical arena. While the devs are candid that other “untethered” VR attractions exist, they’re convinced their tech and experience is better. In particular, a company called the Void has made a splash with several attractions around the country based on major movie franchises like Ghostbusters and Star Wars. One of the ways MassVR’s system accomplishes this is with what the developers call, “Ghost Mode”—a way of relaying where other players are in the room, even if their avatar is on a different level of the compound. “The other experiences, like the Void and Zero Latency, are versus the environment—you can’t play against the people around you,” continues Kendall Roy, who manages the team’s day-to-day operations. “They are a one-time experience. You shoot some zombies that come at you, and that’s it. There’s no interaction. No reason to go back, except to increase your score,” adds Ogar. Even with a thorough explanation, I was dubious that the tech could really work in practice. But sure enough, by my second round of play, I’d gotten my bearings, and I was running, ducking, and rolling around, without fear of sustaining a concussion. Both Roy and Ogar confess they’ve had miniature heart attacks watching users run full speed across the arena. They say no one has ever sustained an injury. “They always manage to stop themselves,” says Roy. Knowing that a piece of the proprietary puzzle that is Mass VR’s tech centers around a modified Oculus Rift, I expected the image quality to be solid, and it delivered. The hardware system is rounded out by a modified MSI VR One backpack and a completely custom-built gun controller. Both sport haptic feedback so you can feel the recoil of the trigger and the shake of your pack as you traverse levels via a rocket pack. Speaking of touch, the headset has been modified to include additional cameras to pick up your movements. This is important because you can reach out and grab objects such as zip-lines that are tracked in VR when you take hold of them up, or hit buttons on control panels to unlock doors; further blurring the real from the virtual. When players visit MassVR, they create custom profiles that track one’s ongoing stats throughout multiple visits, to show player growth and set the basis for a leaderboard board that competitors aspire to top. Just like in standard console gaming, earned points can then be cashed in for better armor and weaponry. A fun bonus: All games are uploaded to Twitch within 24 hours, for bragging rights. Or in my case, for commenters to find delight in my constant yelps of terror while attempting to rocket-pack myself from one level to another. And to be sure, Mass VR isn’t without its shortcomings. For one thing, the integrated audio has room for improvement. The system does not yet split communications between teams, so it was just a lot of incoherent nonsense being blasted into one’s ear. It makes the aspect of planning and executing attacks against opponents a moot point. It felt much more like every player was in it for themselves. VR Champions—a single-terrain, single-objective game—is the only one available for the platform. If MassVR hopes to accomplish its goal of distinguishing itself from other grand-scale VR projects, like the aforementioned Zero Latency, it will need to create something that doesn’t just “amount to a lot of mindless shooting,” as one reviewer characterized it. The novelty will eventually wear off, and what will make MassVR successful is its ability to move past being merely a novel experience. Which brings me to possibly the biggest barrier to MassVR truly reaching the masses: the price tag. A single-session as it stands (made up of three, five-minute rounds) will set players back $39. For the cost of a combined 15-minutes of play, one could buy several games made for traditional consoles. That might seem fine for a one-off, but, again, if the hope is to retain gamers as long-term players, they’re going to need to find a way to make it affordable. The solution might lie in how the company chooses to grow. Lai says plans to open in additional cities are definitely in the pipeline: “We want to build a global network of operators so teams can compete against each other from halfway around the world.” This would allow for a far greater number of players to challenge one another at a time, which could reduce the cost of gameplay, while still protecting profit margins. 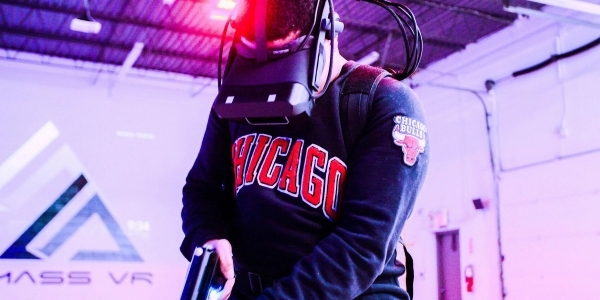 If you’re in the camp of individuals still waiting for an immersive warehouse-scale virtual reality experience to open at a location near you, you might be in luck. They’ve already been in talks with potential operators internationally. I’m cautiously optimistic that this is the advancement in gameplay that VR needs. For as goes the world, so goes the virtual world. And virtual reality is transitioning from being a symbol of the future to a phenomenon of the present. In 2017, the virtual and augmented reality market reached $14 billion in revenue, and IDC’s ambitious projections put that number at $143 billion by 2020. While large-scale arenas like MassVR might only be one piece of that gigantic number going forward, it’s time to stop thinking of virtual reality as a solo endeavor played in our crowded one-bedroom apartments where we don’t have space to run. Perhaps we need the gestalt of an arena to realize VR’s full potential.